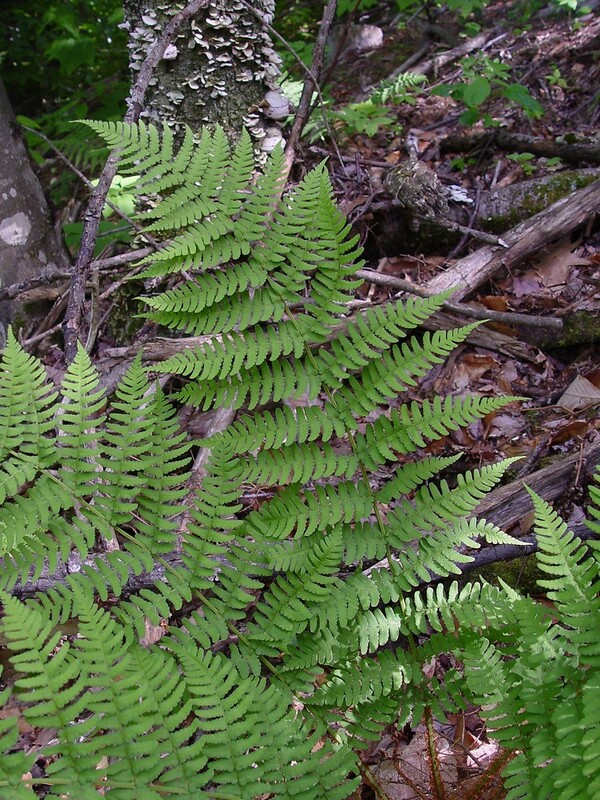 Marginal wood fern is a leathery, evergreen fern, blue-green above and light green on the underside. 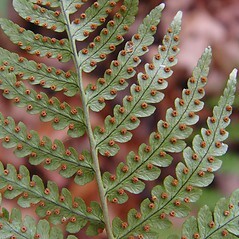 It gets its name from the sori (aggregations of spore-bearing structures in ferns) located at the margin or edge of the underside of the pinnules. sori born between the margins and veins of the ultimate segments and scales of two distinctly different sizes (vs. D. marginalis, with sori borne near margins of ultimate segments and scales not of two distinct sizes). sori positioned near midrib of leaf segments and scales at base of leaf stalk dark brown with a pale border (vs. D. marginalis, with sori positioned near margin of leaf segments and scales at base of leaf stalk pale brown). 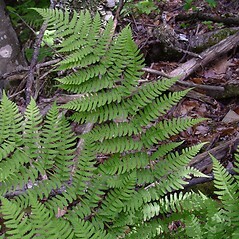 marginal wood fern. 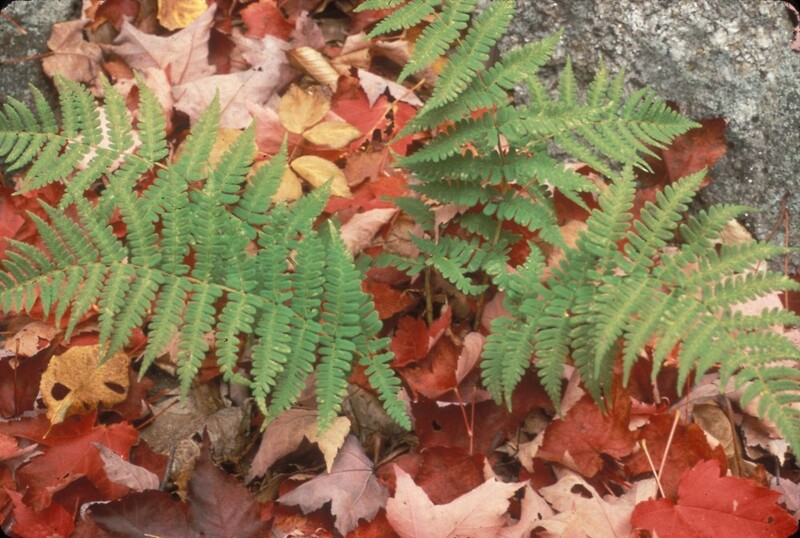 Polypodium marginale L. • CT, MA, ME, NH, RI, VT. Rocky forests, cliff bases, talus, and steep banks. 2×9. 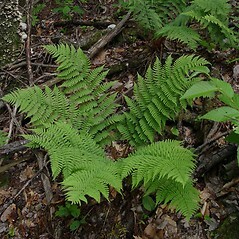 Dryopteris carthusiana × Dryopteris marginalis → Dryopteris ×‌pittsfordensis Slosson is a very rare wood fern hybrid known from CT, MA, VT. It shows sori positioned closer to the margin than the midrib of the ultimate segments, and it has fairly dense scales at the base of the petiole (as do other D. marginalis hybrids). 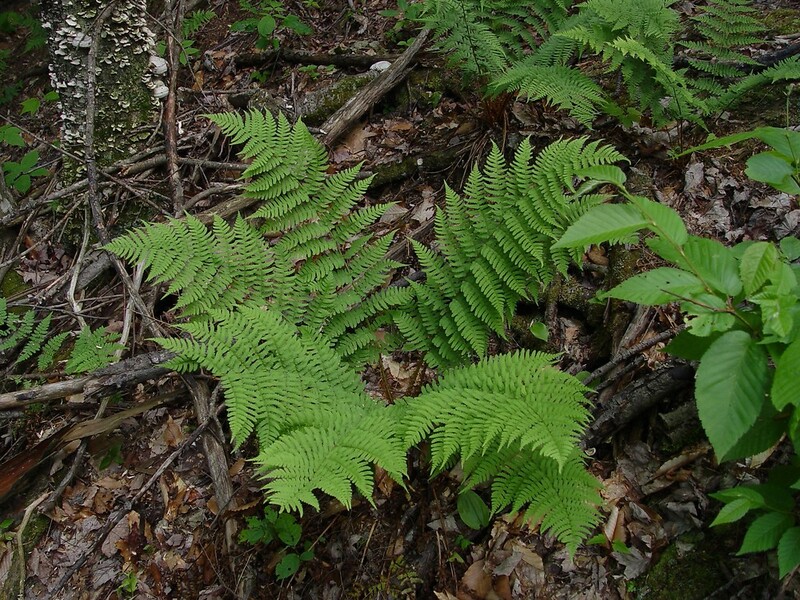 However, the hybrid is very similar to D. carthusiana in regard to overall leaf blade outline, division of segments, and margin of segments (serrate vs. entire or crenate in D. marginalis). 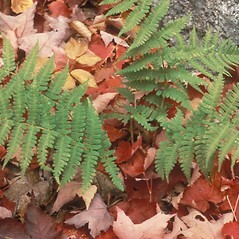 The leaf blade texture is also thicker than in D. carthusiana, lending a semi-evergreen habit to the blade. 3×9. 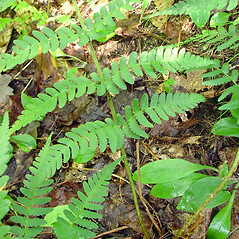 Dryopteris clintoniana × Dryopteris marginalis → Dryopteris ×‌burgessii Boivin is a rare wood fern hybrid known from CT, MA, NH, VT. It is similar to D. ×slossoniae. 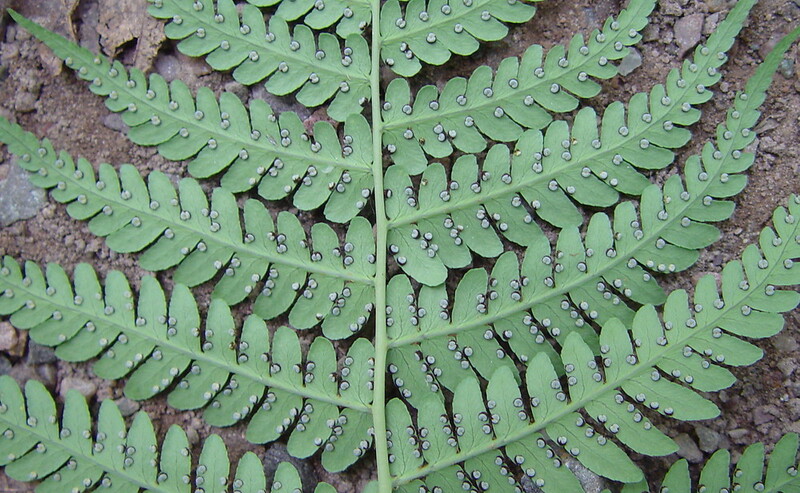 However, the leaflets of D. ×burgessii are not as widely spaced on the rachis, the leaf blades are relatively wider, and the apex of the blade tapers more abruptly. 4×9. 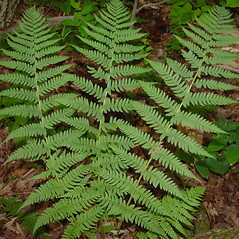 Dryopteris cristata × Dryopteris marginalis → Dryopteris ×‌slossoniae Wherry ex Lellinger is a somewhat rare wood fern hybrid known from CT, MA, ME, NH, RI, VT. It shows sori positioned closer to margin than the midrib of the ultimate segments and fairly dense scales at the base of the petiole (as with other D. marginalis hybrids). 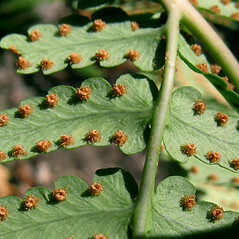 The leaflets are relatively widely spaced on the rachis, the lower ones triangular, and the leaf blades are lanceolate with ± parallel margins (rather than leaflets more crowded on the rachis, the lower ones oblong-triangular, and the blades broad-lanceolate in D. marginalis). 5×9. 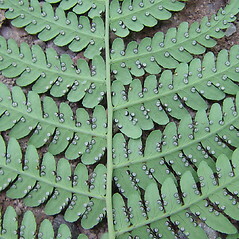 Dryopteris filix-mas × Dryopteris marginalis → Dryopteris ×‌montgomeryi Fras.-Jenk. 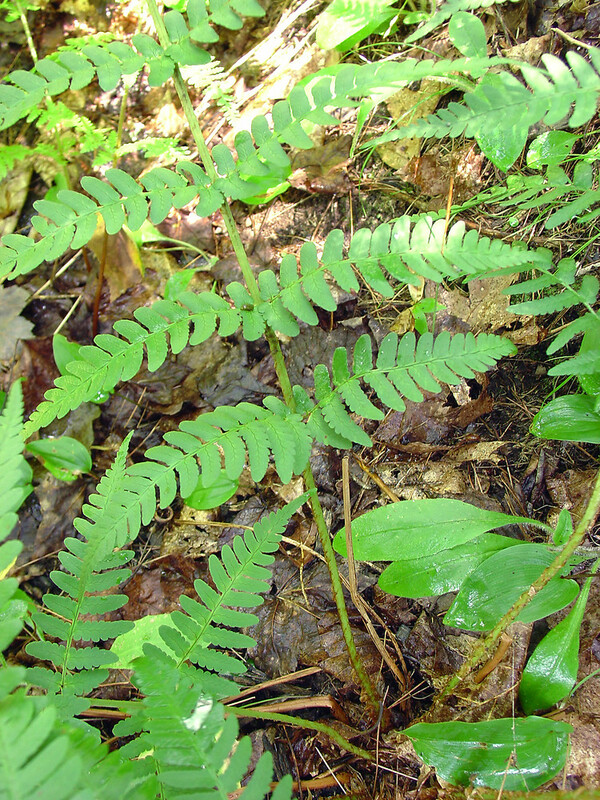 & Widen is a very rare wood fern hybrid known from ME, VT. It shows sori positioned closer to the margin than the midrib of the ultimate segments and fairly dense scales at the base of the petiole (as with other D. marginalis hybrids). 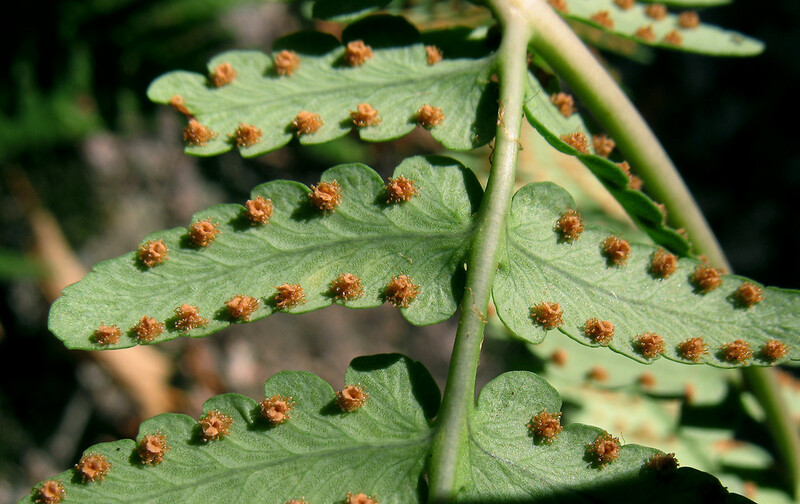 However, the general aspect of the plant is very similar to D. filix- mas, including the leaf blade tapering to the base and to the apex, numerous pairs of leaflets per blade, and abundant scales on the rachis and costae. 7×9. 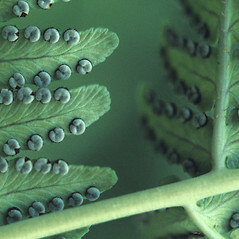 Dryopteris goldiana × Dryopteris marginalis → Dryopteris ×‌neowherryi W.H. 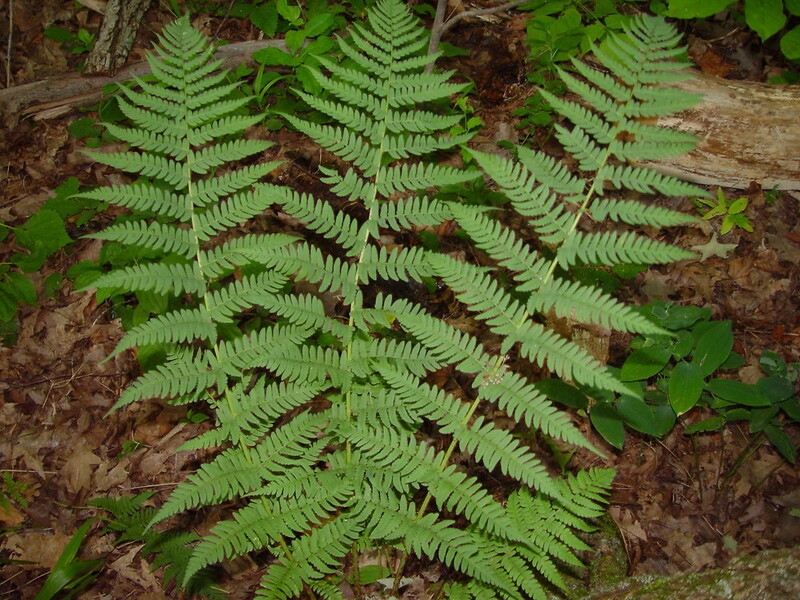 Wagner is a rare wood fern hybrid known from CT, MA, ME, VT. It shows sori positioned closer to the margin than the midrib of the ultimate segments and fairly dense scales at the base of the petiole (as with other D. marginalis hybrids). 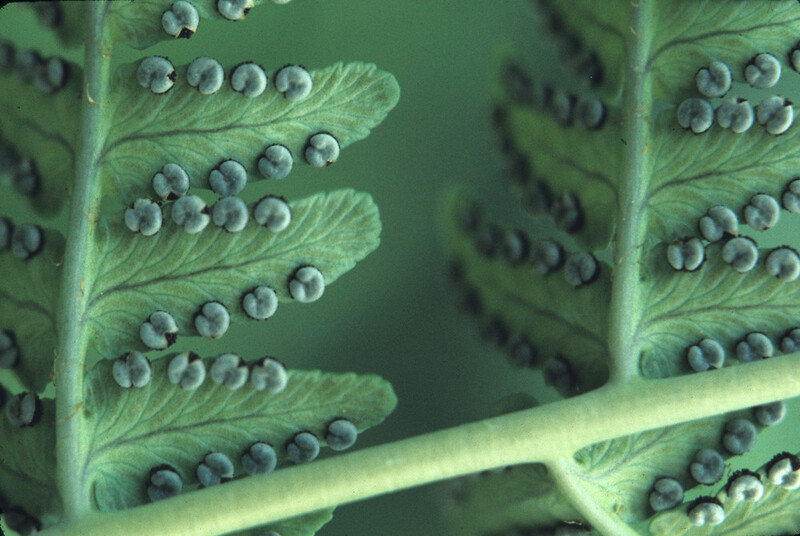 The petiole scales are dark brown, and the leaf blade tapers abruptly at the apex (rather than pale petiole scales and ± gradual taper to apex in D. marginalis). 8×9. 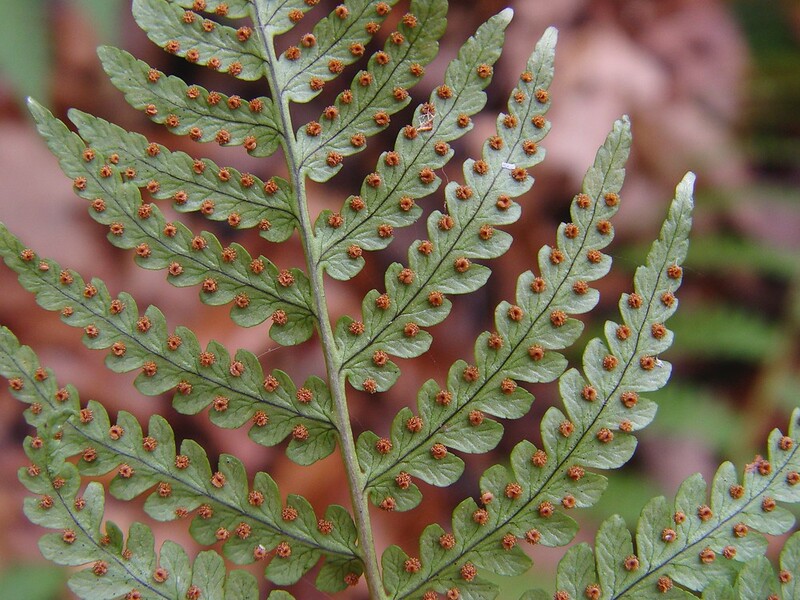 Dryopteris intermedia × Dryopteris marginalis → This is a relatively rare wood fern hybrid known from CT, MA, VT. It shows sori positioned closer to the margin than the midrib of the ultimate segments and fairly dense scales at the base of the petiole (as with other D. marginalis hybrids). The indusia (and often the rachis and costae) have stipitate glands, and the segment margins are serrate (unlike D. marginalis).